So you bought a second-hand iPhone, and you cannot unlock it. The device requires you enter the code, and you do not know it. Or you've forgotten the password, and you cannot unlock it. Entering a wrong passcode several times will disable your iPhone. What you need to do at this point is bypass the passcode so that you can start using your device. Whether you have a newer model like iPhone 8, iPhone X, or an older model like iPhone 4, 5, and 6, there is software that can help you. With that in mind, here is how to unlock iPhone passcode without computer. What To Do If You Forgot Your iPhone Passcode? This way works only if you know your iCloud credentials, and you have enabled "Find my iPhone" on your iCloud. Otherwise, you have to find another way for how to unlock iPhone 6 passcode without computer. However, there is a catch. Remember, Apple does not allow to reset the device's passcode. Basically, you will erase your data, and you will enter new details about your passcode. Before you proceed, make sure you have a backup of your device. Step 1: Go to the iCloud official website, and enter your credentials of the account linked to your iPhone. You can use any handheld device to login to the website, it doesn't have to be a computer. Once you login, the website will give you a couple of options. Click on "Find iPhone" to continue. Step 2: The website will launch a process to find your phone. You will be taken to a new interface. Click on "All devices". Select the iPhone on which you want to bypass the passcode. Step 3: Once the software finds your device, you will be given several options. Click on "Erase iPhone", and then confirm the choice. Step 4: Wait for a few moments so the software resets your iPhone. This feature was introduced to locate your lost iOS device, but you can also use it to perform a factory reset and bypass the passcode. You can use it for how to unlock iPhone 4 without iTunes or computer. 1. Just activate Siri on your device. All you have to do is long press the Home button. Ask Siri what is the time, like "Hey Siri, what time is it?" 2. Siri will then display the present time. There will be a clock icon adjoining to it. Tap on the clock, and you can access World clock feature. Click on "+" icon to add another clock. 3. You will get a search bar where you need to enter a city. Write anything just so you provide a textual entry. Tap on the text, and then click on "Select all". 4. At this point, you will get new options, including cut, copy, etc… Tap on "Share" button to continue the process. You will get options for sharing the text. Click on the Message icon.Your phone will open a new interface. Basically, you start drafting a new message. Go to the "To" field, and type any text. Tap on the return button to continue the process how to unlock iPhone 4 without computer. 5. The text will turn green. Now that your text is selected, click on "+" once more to add icon. Once you tap it, a new interface will open. Click on "Create new contact" to continue. You will now be taken to an interface where you can add a new contact. Tap on "Add photo" this time to continue. 6. Click on "Choose photo" button to select a photo from your library. Once the photo library opens, you can browse the albums. Do not click on any album. Instead, wait for a few seconds, and then tap on the Home button. You will be taken to the Home screen. Can't remember that passcode? 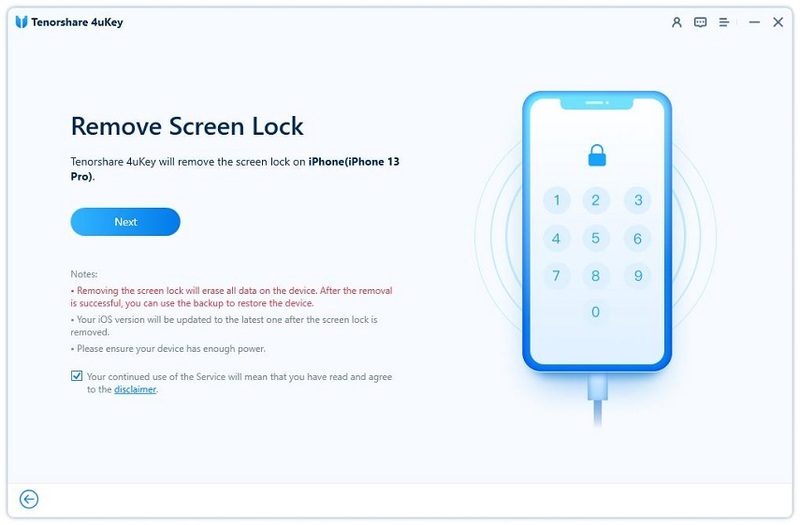 And you also can't use the iCLoud, iTunes, or your devices vesion is over 10.1, sue 4uKey is the easist way to unlock your iPhone in minutes. Just follow the simple 3 steps, you will get your locked iPhone unlocked. 1. Download 4uKey on you windows or Mac, then install and open it. 2. Connect your iPhone then click "Start", you will see the screen that the program ask you download the firmwave package, then click "Download" to get it. 3. After the firmwave package have been download succefully, tap "Start Unlock" to start the process. The whole precess will take some tiome, please wait till your the removal process has done. As you can see, there is a trick for how to unlock iPhone passcode without or with computer, or any other iPhone for that matter. After you'v unlocked iphone passcode successfully, you also can use Tenorshare UltData to restore your backup files from iTunes and iCloud. And it works better than just restoring from iCloud. The main difference is you can selectively restore items, not all files. And UltData gives you a preview of all the items before restoring.